Loomstate !Act Natural! Blog: Celebrate the 41st Earth Day with Loomstate! 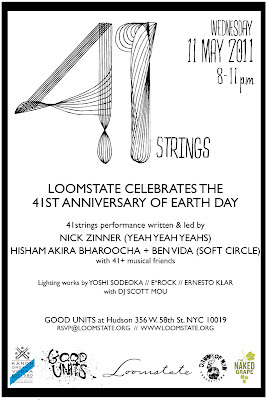 Celebrate the 41st Earth Day with Loomstate! We're doing it again and we're doing it big! Last year, 40 Drummers was more epic than we had ever imagined. 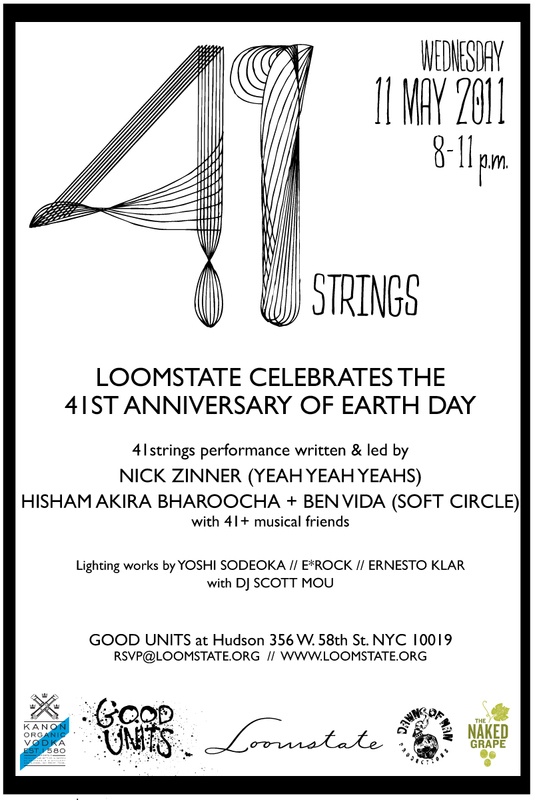 With original music composed by Nick Zinner (Yeah Yeah Yeahs) and Hisham Akira Bharoocha & Ben Vida (Soft Circle) from 40 Drummers, performed by 41+ uber-talented musicians, this year's is no doubt going to be just as awesome as the last. We're talking 41 STRINGS - that's violins, violas, cellos, electric & acoustic guitars, upright bass, electric bass, on top of synth and drums. Super rad lighting works by Yoshi Sodeoka, mixed by E*Rock and produced by Dawn of Man, and also by Ernesto Klar will be candy for your eyes. Kanon Organic Vodka and wine from The Naked Grape will take care of the rest. Check out last year's video. Trust us, you don't want to miss this one! More event info and updates here.